Worshipers believed that they could hear the voice of the god Apollo, speaking through a priestess. Questioners paid a levy called a pelanos and sacrificed an animal on the altar. The questions were then put to the Pythia by a male priest and she would answer in a trance, perhaps induced by vapors from a crack in the ground under her feet. This is how the Oracle of Delphi operated. It was the most famous place in all Greece for predicting the future, and advising about everything. From a powerful king, to the most humble peasant, everyone wanted an advice on what decision to take or how to do things. Unfortunately for them, the answers were often ambiguous. Not only Greeks, but barbarian monarchs as well sent envoys to consult the oracle and expressed their gratitude by dedicating sumptuous gifts and votive offerings to the god. According to the legend, when Zeus released two eagles from opposite ends of the world, their paths crossed in the sky above Delphi, establishing the site as the center of the earth. That’s why the gods chose this spot, as their primary sanctuary. 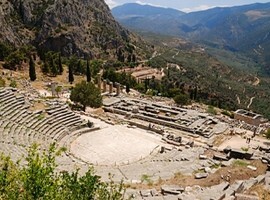 The location of Delphi Stadium and the ruins of Apollo’s temple is such that the whole valley lays before the visitor’s eyes. As soon as you reach the foot of the Phaidriades, at the Kastalian Spring, you can see two rocks separated by a tremendous canyon, crossed by the Bear’s stream. The stream continues all the way down the slope, deep into the thicket. And there, at the point where the two rocks meet, in the deepest recess of the gorge the water of the celebrated Kastalian Fountain where both priests and pilgrims cleansed themselves before entering the temple. 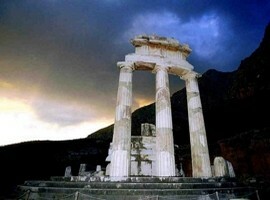 The Temple of Apollo has stood on this site since the 6th century BC and remains visible even today. 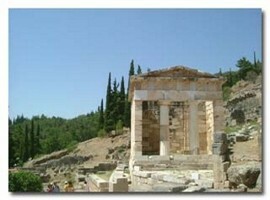 The remains of the temple is a set of five pillars, the last remaining corner section of the large temple area. The Tholos at the sanctuary of Athena Pronaia is a circular building that was constructed between 380 and 360 BC. 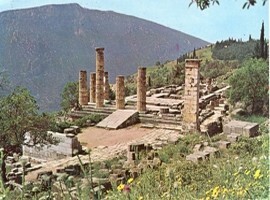 The Tholos is located approximately a half a mile (800 m) from the main ruins at Delphi. 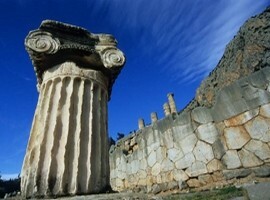 Three of the Doric columns have been restored, making it the most popular site at Delphi for tourists to take photographs. 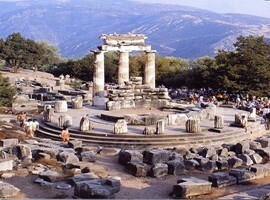 The Archaeological Museum of Delphi is situated next to the archaeological site and is one of the best museums in Greece. It has wonderful collection of scriptures dating back to the 5th century B.C. the museum also housed the majestic Charioteer dating back to 470 B.C. and is made entirely of bronze. The ancient theatre at Delphi was built further up the hill from the Temple of Apollo giving spectators a view of the entire sanctuary and the valley below. 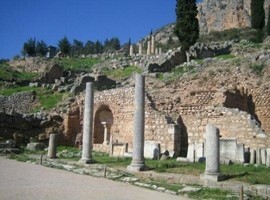 It was originally built in the 4th century BC but was remodeled on several occasions since. Its 35 rows can seat 5,000 spectators. 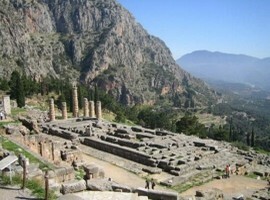 With the political rise of Delphi 6th century BC and with the reorganization of the Pythian Games, Delphi’s golden age which lasted until the Romans period, about 191 BC. The path to the Temple of Apollo was originally lined with 3,000 statues and treasures, built by the cities and states, to house their people’s offerings. The Sanctuary of Apollo is also known as the Sacred Precinct which is the heart of the complex that also included a stadium and a sacred spring.